The pilot reported that, after three attempts to land the airplane at the one-way, private grass airstrip, the wind had become a tailwind. During the fourth approach, the wind was "apparently stabilized", but once he committed to land the wind increased and became a hazard. He added that the airplane was then "too low to abort" and the airplane landed long. Subsequently, the airplane was unable to stop, overran the runway, and impacted a power pole. The airplane sustained substantial damage to the fuselage, empennage, and both wings. The automated weather observation system about 9 nautical miles away from the accident site reported that, about the time of the accident, the wind was from 220° at 5 knots. The pilot landed to the east. 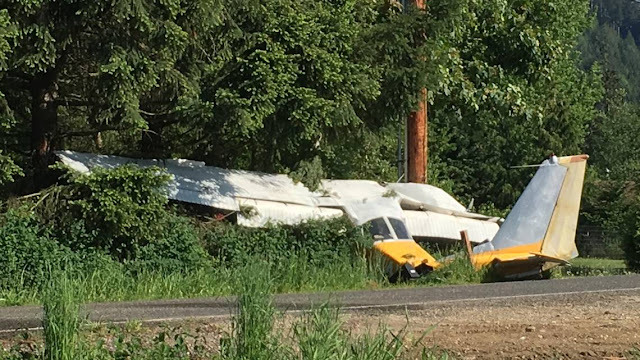 Law enforcement and fire crews responded to the scene of a northern Whatcom County plane crash Monday afternoon. Shortly before 4 p.m., crews were called to the 6800 block of Goodwin Road near Everson for the report of a small airplane crash, according to emergency radio traffic. A Cessna airplane struck a power pole with its wing while taxiing after it landed, impacting the power lines, according to Allen Kenitzer, a spokesperson for the Federal Aviation Administration. The aircraft was not in flight at the time, Kenitzer said. Local authorities said only the pilot was on board, Kenitzer said. He did not have an update on the pilot's condition, but according to emergency radio traffic, the pilot had a head injury but was conscious, breathing and out of the plane. The Federal Aviation Administration and National Transportation Safety Board will investigate, Kenitzer said. The plane was reported to be leaking fuel.